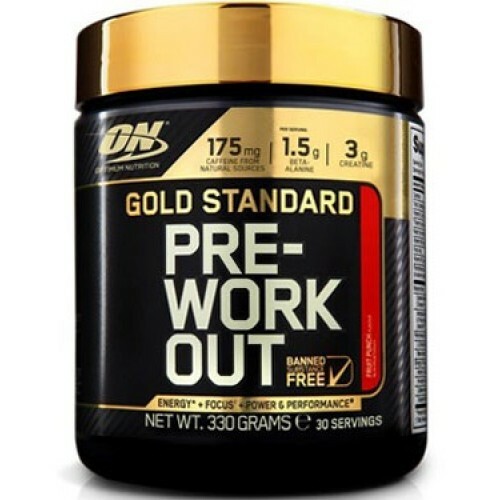 ON's new Gold Standard Pre-Workout® unleashes amplified energy, focus, and supports enhanced endurance to help you reach the pinnacle of your game, crush your next set, get that last rep, and achieve some true gains. * Whatever your goals, accomplish them all with the pre-workout from the most trusted brand in sports nutrition. The Gold Standard of Flavors: ON has also raised the bar on flavor. Available in options such as Blueberry Lemonade, Watermelon, Pineapple, Green Apple, and Fruit Punch, Gold Standard Pre-Workout™ leaves all other pre-workouts behind on performance AND taste. You take your workouts and performance seriously. Don't settle for a second place product, get the legit pre-workout that’s as GOOD AS GOLD! Creatine Monohydrate, Amino Acids, Citric Acid, Malic Acid, Tartric Acid, Flavouring, Colours (Beetroot Red, Beta Carotene, Curcumin) Silicon Dioxide, Calcium Silicate, Narural Caffeine , Gum Blend (Cellulose Gum, Xanthan Gum, Carrageenan), Anti-Caking agents (Silicon Dioxide, Calcium Silicate) Sucralose, Malic Acid, Acesulfame Potassium. Mix each servings with 200ml of water and consume 20-30 minutes before training. Start with 1/2 sachet or less to assess your tolerance. DO NOT EXCEED 2 SERVINGS PER DAY. Warnings: CONSULT YOUR PHYSICIAN BEFORE USING THIS PRODUCT IF YOU ARE TAKING ANY MEDICATIONS OR ARE UNDER A PHYSICIAN’S CARE FOR A MEDICAL CONDITION. NOT FOR USE BY THOSE UNDER THE AGE OF 18, WOMEN THAT ARE PREGNANT, TRYING TO GET PREGNANT, OR NURSING, OR THOSE THAT ARE SENSITIVE TO CAFFEINE, NIACIN OR BETA-ALANINE. DO NOT CONSUME CAFFEINE FROM OTHER SOURCES WHILE TAKING THIS PRODUCT AS TOO MUCH CAFFEINE MAY CAUSE NERVOUSNESS, IRRITABILITY, SLEEPLESSNESS, AND OCCASIONALLY RAPID HEARTBEAT. BETA-ALANINE AND NIACIN MAY CAUSE A HARMLESS, TEMPORARY TINGLING OR FLUSHING SENSATION. KEEP OUT OF REACH OF CHILDREN. Contains 175 mg of caffeine per scoop.